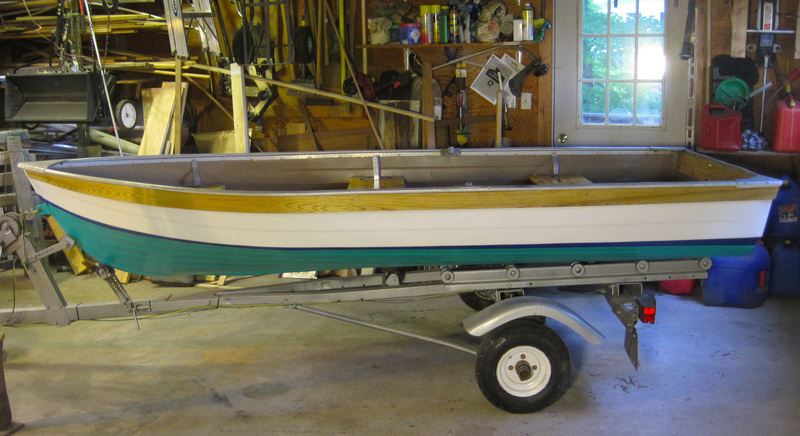 Patrick MacQueen of Hancock, New Hampshire, got a great package deal on an aged 12′ aluminum skiff, Evinrude outboard, and trailer. He counted his $500 as well spent: “Aluminum boats are rugged and have great utility,” he wrote, “but they sure can be ugly.” The interior was painted gray with black and white flecks, and the exterior was chalky with oxidation. Decals, cracked and peeling, identified the outboard skiff as a MirroCraft. 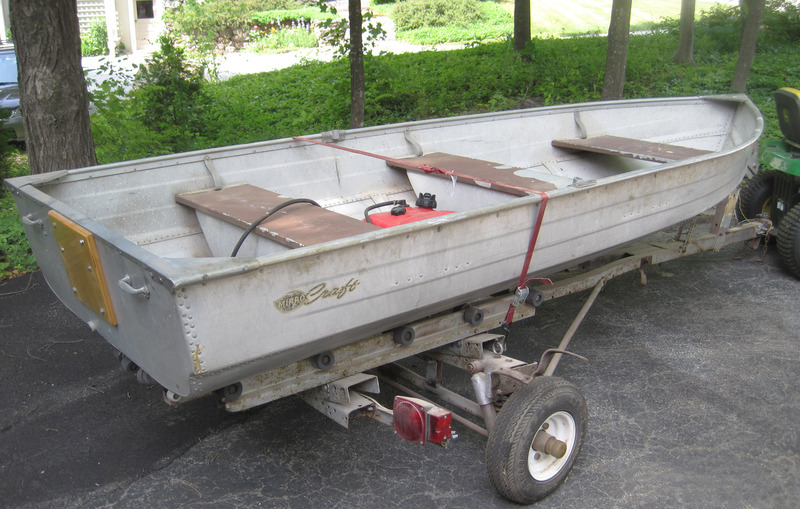 The old aluminum boat wasn’t much to look at but still had plenty of life left in it. The Mirro Aluminum Company got its start in Manitowoc, Wisconsin, making kitchen cookware—aluminum pots and pans—and in 1956, confident that their experience making stove-top vessels that could keep water in, decided to manufacture boats that could keep water out. The first steps in the transformation of the MirroCraft were a paint job and the addition of a faux sheer strake in ash. Patrick, approaching retirement and seeing boatbuilding would fill the leisure hours he’d have ahead of him, thought the skiff would be a good winter project and decided to do much more than put a new finish on the still serviceable hull. He pulled out the factory-installed aluminum seats. They were covered in mahogany-brown vinyl, and as unpleasant to sit on as they were to look at. They’d be replaced with warm, bright-finished cedar thwarts. 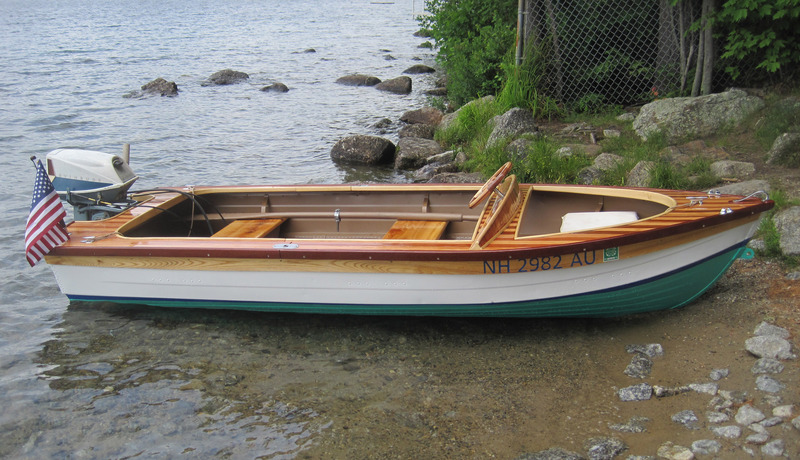 After giving the boat a three-tone paint job, Patrick add faux sheerstrakes of varnished oak. The skiff’s flat sheerline made it possible to get the nearly straight planks out in one piece from long ash boards. The core of the wheel is aluminum salvaged from the original seats after they were removed. 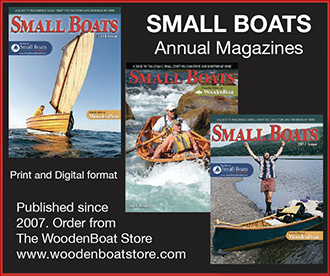 Earlier in the boat’s life, it’s likely that the skipper sat in the stern, steering the with outboard’s tiller, and with all that weight aft, the bow would have been well out of the water. Patrick decided to improve the trim by moving the helm forward so he could pilot the boat from the center thwart. 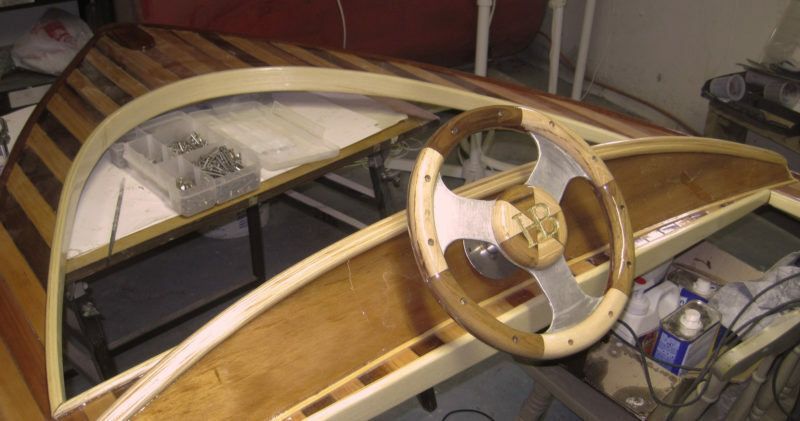 He decked the boat, creating two cockpits separated by the dashboard. The deck’s 3/16″ plywood substrate was gussied up with strips of cedar, an ash coaming, and a mahogany rail. Cedar decks, trimmed in ash and mahogany, completed the transformation. The original thwarts that Patrick removed didn’t go to waste. He used the aluminum for the wheel and trimmed it with maple and walnut. More bits of the aluminum were pressed into service as the thwart-mounted throttle and shifter. BUTTERFLY, all dressed up, now gets admiring looks, which had never come her way in her previous life. 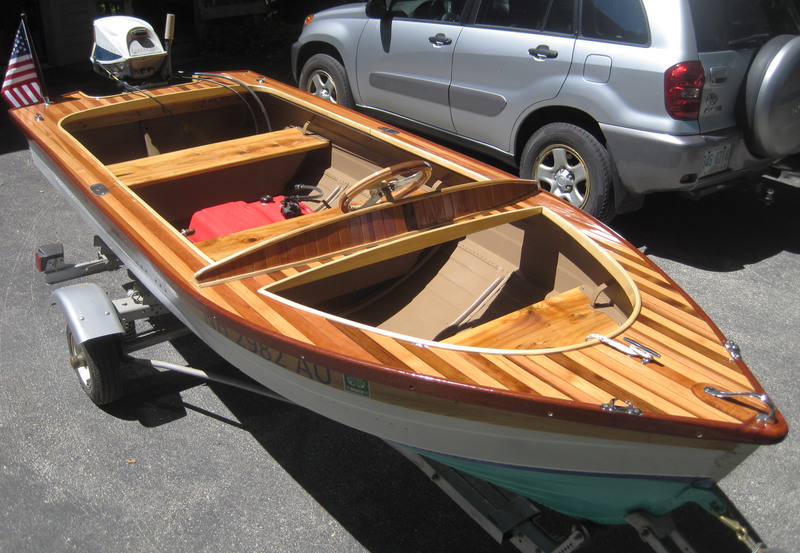 The name BUTTERFLY graces the transom, appropriately, and the transformed skiff has been on just about every lake within a 30-mile radius of Patrick’s home. That’s a lot of lakes, and a lot of people have seen and admired the boat, never guessing that its ancestors were pots and pans. Skipper says she’s beautiful! Great vision. What is the total thickness of the wood deck—3/16″ ply plus the cedar/ash strips? Does the deck support weight of someone sitting or standing on it? How did you attach the deck to the hull?